Dutch superyacht builder Mulder Shipyard has officially launched the first Mulder 98 Flybridge motor yacht. Commissioned by a Russian client, the 30.5 metre superyacht was designed by Guido de Groot Design. With naval architecture by Ginton Naval Architects, the full aluminium yacht features a round bilged hull and was built to RINA classification standards. She accommodates eight guests in four staterooms and a VIP suite, all with en suite bathroom facilities. The owner’s stateroom features portholes on both sides and a spacious walk-in closet. The custom built interior was designed by Kitty van der Kamp Design and is finished in walnut. The luxury yacht also boasts a capacious saloon with a dining area seating eight. The aft of the yacht houses the crew quarters, including two cabins with bathroom facilities. The quarters are reachable from the main deck, side deck and swimming platform, providing easy access to the engine room. The flybridge features deck chairs, two U-shaped sofas and a wetbar with grill, icemaker and refrigerator. 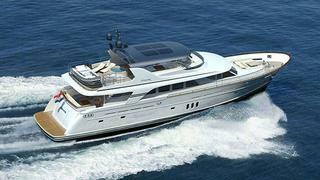 Both the flybridge and swimming platform can accommodate a tender. Powered by twin Caterpillar C32 1,600hp engines, the motor yacht can reach a top speed of 22 knots. With a 17,000 litre fuel capacity, she has a transatlantic range of 4,500 nautical miles at 10 knots. The Mulder 98 Flybridge’s delivery is set for later this month. She will also be exhibited at the HISWA Amsterdam Boat Show in September.